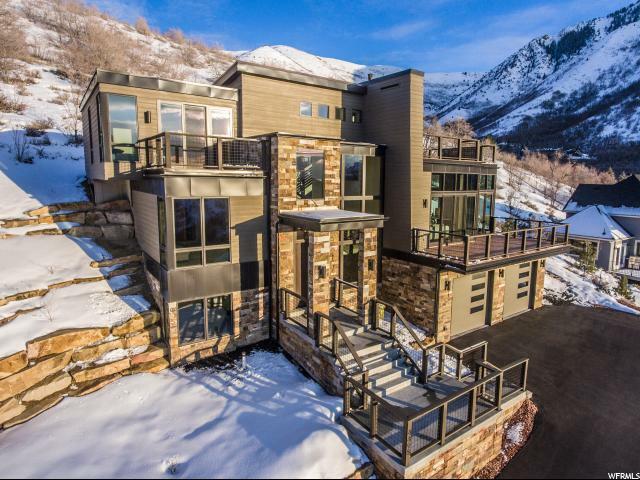 All Emigration Canyon homes currently listed for sale in Emigration Canyon as of 04/25/2019 are shown below. You can change the search criteria at any time by pressing the 'Change Search' button below. If you have any questions or you would like more information about any Emigration Canyon homes for sale or other Emigration Canyon real estate, please contact us and one of our knowledgeable Emigration Canyon REALTORS® would be pleased to assist you. 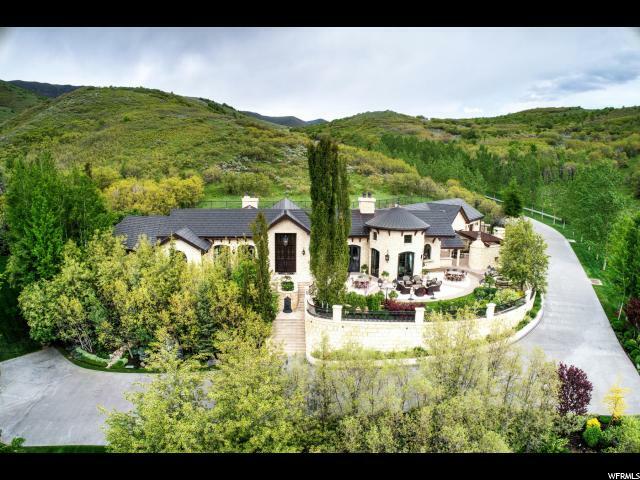 "Built in 2003, this luxury estate sits on about 183 acres adjacent to the Wasatch National Forest in Emigration Canyon, east of Salt Lake City. As you approach the home through the private gate and down a secluded road, it is easy to see that each season holds new surprises in landscape treasures and natural beauty on these easy to maintain grounds. The wildlife and sunrise/sunsets will delight. This masterpiece mixes a sophisticated design and stunning customizations with historical finishes selected from around the world. An open floor plan, outdoor living areas and large windows give this home the feel of a secluded mountain estate in a private, serene setting. As you enter the home through front doors imported from France, a 19th century Baccarat and rock crystal chandelier draws your eye toward the soaring vaulted ceilings that meet you. For entertaining, there is an expansive patio complete with fireplace and pizza oven for capturing the majestic mountain setting, a central fireplace and space for guests to mingle and spill over into the large family living room. An exquisite gourmet kitchen with large island combined with a catering kitchen that includes incredible storage and countertop space to make this an entertainer's dream. The master suite opens through doors crafted in the 1700's into the perfect pairing of elegance and functionality, with French doors inside the shower and one of the most amazing closets and seating areas you will see in any luxury home in Utah. There is also an elegant office, an exercise room, a main floor theatre room and plenty of storage. The grounds are designed for the whole family and feature a hot tub, water features, an attached 4-car garage, heated driveways, a detached/oversized 4-bay garage, greenhouse and an additional structure for maintenance equipment of the estate on the main level and a large caretaker apartment on the second level. This is the first time this timeless estate has been offered for sale. With incredi"
"This majestic historic estate is located in Pinecrest Canyon at the top of Emigration Canyon. Originally constructed in 1915, and sits on 6.73 acres. The elaborate ornamental iron entrance gates originated from Paramount Studios in Hollywood. The home has been a private residence as well as a bed and breakfast in years past (The Royal Scotsman and Pinecrest Inn). It has 5 suites in the main house and has two studios in the guest house. There is also an armored guard shack at the entrance that was manned 24/7 when a previous owner resided there. A stream runs through the length of property and collects into a picturesque trout pond. The main living room is a great vantage point to view the scenery with floor to ceiling windows to take it all in. The multi tiered lawn and gardens are spectacular, with custom rock walls and pathways. All the while you hear the running water in the background. This place is a truly magical retreat. Viewing wildlife is commonplace on the grounds. It is 15 minutes to down town Salt Lake and 30 minutes to Park City. Plenty of biking and hiking trails are near by. There are also 3 golf courses with in a 10-15 minute drive. Come experience this amazing property. " "Welcome to luxury living in Emigration Canyon. This home was custom designed and built in 2018 to take advantage of the stunning 360 degree views offered by the 1.02 acre lot. 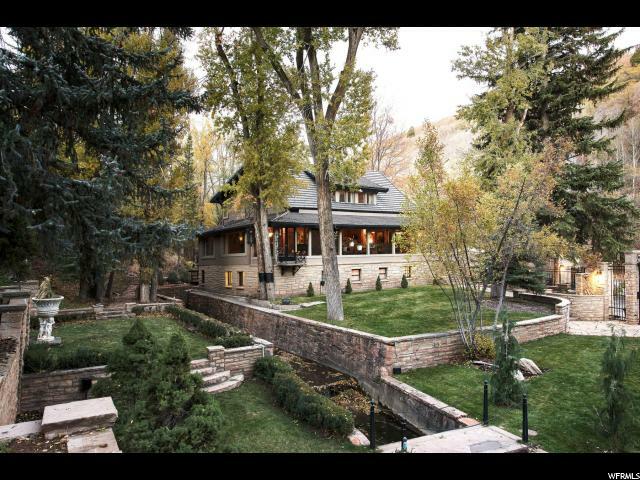 The house is situated in a private, gated community just minutes from Salt Lake City. Every room has been meticulously laid out to provide an incredible sense of connection with nature, while remaining private and cozy. The definition of Mountain Modern. Only the highest quality materials used throughout. Upon entering you're greeted by an impressive steel moment frame upon which the house rests. Hand crafted stairways. The kitchen is adorned with custom walnut cabinetry, professional grade appliances, and brilliant White Macaubus counter tops. Floor to ceiling windows bring in the light. In the living room the fireplace, surrounded by dry stacked stone and walnut paneling, invites you to watch the clouds roll through the canyon and deer in the back yard. Sit beside the fireplace on the rooftop deck and enjoy incredible mountain views. Custom floating walnut vanities embellish each of the five bathrooms. The master bath offers a large soaking tub, steam shower, walk-in closet, and incredible Aurea Stone quartz. A three minute drive puts you at Ruth's Diner for a wonderful brunch. Ten minutes gets you into Salt Lake City. Unparalleled access to the outdoors via hiking, biking, ski resorts all while enjoying everything Salt Lake City has to offer. Incredibly energy efficient with 95% furnace and water heater. Blown-in and closed cell foam insulation, multiple furnaces and A/C units, and triple paned glass. This house has it all. Square footage figures are provided as a courtesy estimate only and were obtained from blueprints . Buyer is advised to obtain an independent measurement. "